The Healthy Schools initiative is a partnership of educators, students and the community that is designed to promote the physical, emotional and social healthof the school community. A Healthy Schools approach follows a six-step process and uses the Ministry of Education’s Foundations for a Healthy School framework. The purpose is to engage the whole school community to take action on health topics that are important to them. Talk to your school administration and follow the six-step process. Call Public Health at1-800-265-7293 ext. 4111 or e-mail schoolhealth@wdgpublichealth.ca for support and resource recommendations. 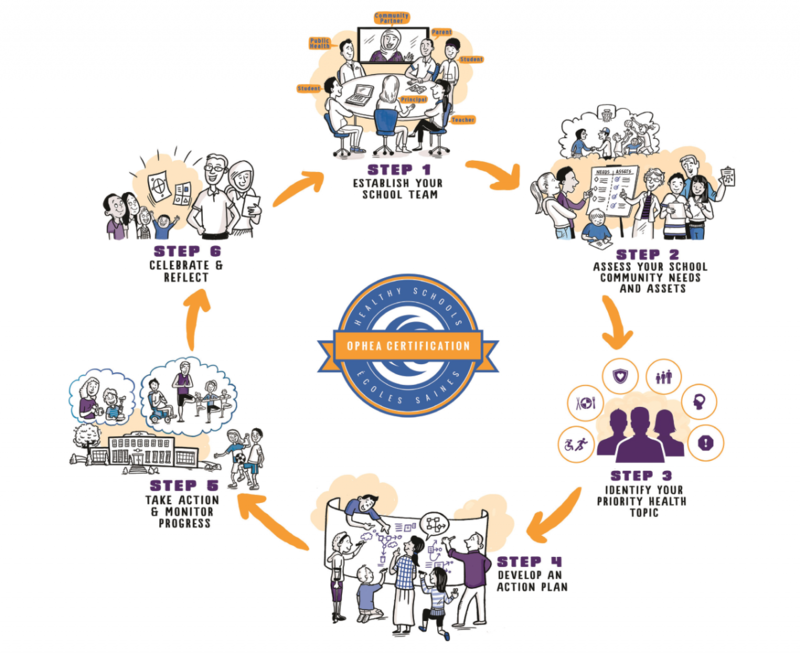 Register with Ophea’s Healthy Schools Certification initiative. Visit ophea.net/HSCertification. To view the Ministry’s framework, click Foundations for a Healthy School at edu.gov.on.ca/eng/healthyschools.